Return of the Rock Star? This past Saturday it felt like Giants fans were transported back to 2009. Tim Lincecum was on the mound firing fastballs past hitters and throwing fall of the table breaking pitches. It was filthy, it was nasty, and it was absolutely beautiful. The sight of the number 55 jersey unfolding through the Freak windup, and legs exploding forward towards the hitter, felt like it had been sorely missed. Tim Lincecum is "Our Guy" among Giants fans. He became the Franchise after it appeared that Barry Bonds would fade away. We all hitched our wagons to Timmy back in 2007 and were off. Rock Star has been used to describe the atmosphere around Lincecum starts. Now, I am all the way in Florida, but even in my house there has always been a different vibe when Timmy would take the mound. The term "Happy Lincecum Day" is a popular phrase used on Twitter and I assume it is that way at AT&T. 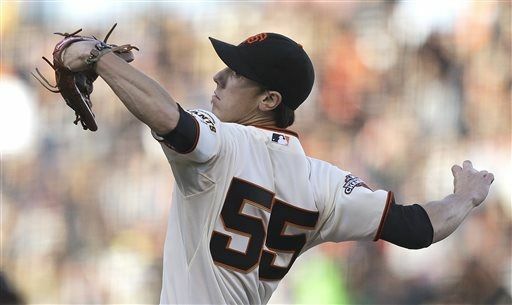 Personally, I have all sorts of love for Tim Lincecum. I feel that he was the cornerstone of building this team in to winners. I have used, and still use, the number 55 with some of my accounts. You may remember that before I changed my Twitter handle to @2outhits, because you know I am selfish and want to promote the blog, I used to be known by @fuzzyblister55. It's funny, because Lincecum has struggled a bit the last couple of years, so when he goes out and throws 6.2 shutout innings, it now becomes "Vintage Timmy". Well, I got curious as to how he performed in his 4th start of the year throughout his career. The results were quite good. Tim Lincecum has never lost his 4th start of the season. Weird. In fact, he hasn't ever given up more than 1 run. The fourth trip through the rotation seems to be when he really starts to get his feet under him for the season. Back in 2008 Lincecum shut down the Cards with 6H 0R 3BB and 5K's, all swinging, over 7 innings. In 2009 it was more of the same with 8IP 5H 1R and 12K's, 9 of which were swinging, in 8 innings of work. The Giants beat the DBacks 5-1 in Arizona. Year after year it seems to be the same kind of outing for him. That's pretty impressive stuff. Last year against the Mets he was pulled after 5 because of the 5 walks. His pitch count was 108 after those 5 innings. The other thing that amazed me was how many swinging strikeouts he rings up. Timmy doesn't fool the hitter's head as much as he fools the bat. Does this mean that the dominating Tim Lincecum is back? I sure as heck hope so. It was fantastic to watch him pitch like that again. Hopefully this will propel him forward and have more great outings like Saturday Night. Welcome back Rock Star, please don't make it a one time gig. Write more posts! This is a good one.